The experience of a lifetime from up to 12,000 feet! 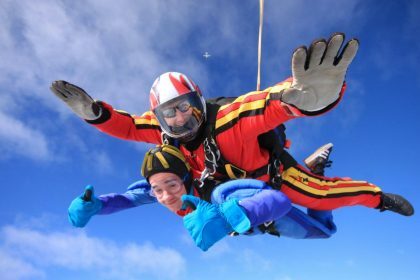 A tandem skydive is the ideal first jump – you will experience the thrill of freefall and enjoy a high performance canopy ride whilst attached to a fully qualified instructor. On arrival you will be introduced to your tandem instructor who will take you through all the training required for you to do your skydive. This includes a talk about the equipment to be used, aircraft orientation as well as covering what you can expect in freefall and finally the position you need to adopt for landing. The training takes about 30 minutes and your instructor will be pleased to answer any questions that you may have. For your jump we will provide you with a jumpsuit, gloves, goggles and headgear. Next you will be fitted into the dual harness. You will be jumping from up to 12,000 feet. It takes around 15 minutes for the aircraft to reach altitude so you will have time to relax and enjoy the spectacular views. Once at altitude, you are ready to go! You will be freefalling at 120mph for about 45 seconds. Your instructor will deploy the parachute by 5,000 feet. The parachute has dual controls so you can aid the instructor by spiralling the parachute around the sky. Your instructor will take control of the parachute for the landing. All in all it is an experience guaranteed to take your breath away! 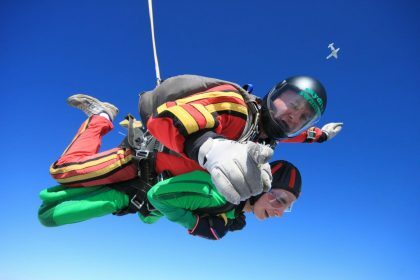 To commemorate your skydive you will be presented with a certificate at the end of the jump. 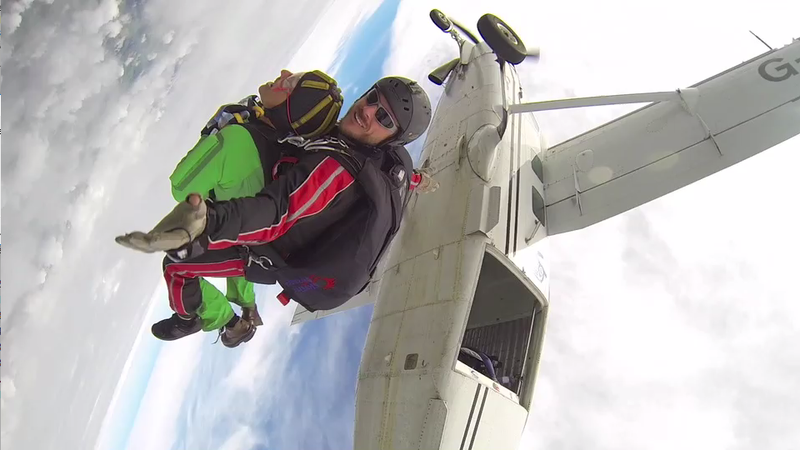 The cost for the tandem skydive, includes the instructor payment and third party insurance. A deposit of £50 is required at the time of booking. You do not need to be an Olympic athlete to become a skydiver but there are limitations as regards to your weight – Regular tandem limits are 15 stone for men and 13 stone for ladies. Ground Rush tandems are 16 stone for men and 13 stone for ladies. (All weights fully clothed). When were you looking to jump? Please remember we cannot hold spaces until we have received your booking form and deposit. Once we have received these if there was a problem with the dates you have indicated on the booking form we would contact you.